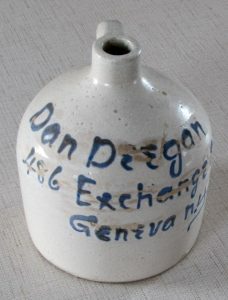 In a cupboard at Rose Hill, the Historical Society stores a jug marked “Dan Deegan, 486 Exchange Street Geneva NY.” So who was Dan Deegan? 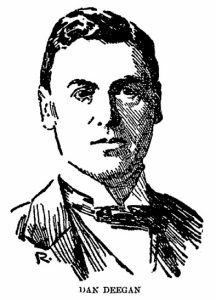 An online search pulled up a fair amount of information about this local Irish businessman with the earliest reference from the Rome Daily Sentinel of February 16, 1889. There was a piece on boxing matches at the Opera House in Rome, and it said a Dan Deegan of Syracuse was the second for the boxer Watson. This is probably the Dan Deegan who later came to Geneva – he was born in Syracuse in 1861 and loved boxing. The Newark Union first noticed Deegan in May 1890. Ford Gardenier and Deegan (“formerly of Syracuse”) were opening a restaurant called The Store. The Union emphasized the lavish character of the new place, including “rich curtain and ornaments,” and a dark blue façade “which will be ornamented with gold leaf.” Inside were three large oil paintings called “Morning,” “Evening,” and “Ready for the Bath.” The last name hints that The Store was primarily a men’s hangout. About a year and a half later, Gardenier left the partnership. Deegan painted the façade white, and soon added a pair of fancy brass signs with his name on them. He bought a large portrait of Bob Fitzsimmons, middle weight champion, to go with his portrait of heavy weight champion John L Sullivan. In May 1892, the Rochester Democrat and Chronicle recorded a saloon license being granted to Deegan. It sounds very promising, but perhaps all this splendor was attracting fewer patrons than he had hoped for. By March 1893, Deegan was planning to move to Geneva. “Daniel Deegan has fitted up his saloon in regal style,” said the Geneva Advertiser on May 15, 1893, “and when completed it will be the handsomest resort in Geneva. We met him for the first time last Wednesday evening, and he is a genial, good hearted man.” An ad in the Hobart Herald from November 1, 1894, indicates that The Store of Geneva offered imported ales, wines, liquors and cigars. The ad also mentioned fine billiard parlors next door. Visitors were unstinted [sic] in praise of Deegan’s magnificent café appointments, than which we venture to say none more costly and elegant can be found outside the great metropolis. The layout in viands . . . were in keeping with the beautiful ornamental furnishings. . . . Such a place, conducted in all respects in strict conformity to law and the terms of a legal license is a credit to Geneva. We bespeak for the “Alhambra” a generous patronage and every measure of success that its popular proprietor could wish” (May 10, 1895). The reference to strict conformity to law may have been a bit pointed. In the preceding February, Deegan had appeared in a Rochester court and plead not guilty to gambling and violation of the excise law. The Advertiser did not explain how the case was settled (February 5, 1895). NO MORE BASE BALL . . .
Dan Disgusted by the Conduct of the Alhambras – He Says he is Through With Base Ball Forever – . . .
A very unsatisfactory game, from every point of view, was that played at Pre-emption park yesterday, between the Alhambras and the Canandaigua Rustlers. Not only was the game wholly without interest for the fans, but it was of such caliber as to disgust and anger the management. Even genial Dan Deegan, who seldom allows anything . . . to ruffle his calm demeanor, said a naughty word when he observed the disgraceful conduct of his pets. He stood it until the fifth, and then . . . boarded a car for home. . . . Mr. Deegan said . . . “I am disgusted with the men who compose the Geneva base ball team, which has become known as my property. The game . . . was a most disgraceful exhibition; the conduct of the so-called ball players in my employ was shameless. . . . Whether the poor playing was the result of a spree the night before I am unable to say. Anyway, I am disgusted . . . Ball next year? Yes, if someone else pays for it” (September 15 1897).